A $2 million Mega Millions ticket in Friday's drawing was sold in Northeast Philadelphia. A Mega Millions ticket worth $2 million in Friday's drawing was sold in Northeast Philadelphia. The winning ticket, sold before the jackpot rolled over to $449 million for Tuesday night's drawing, one at Yorty's Deli, 5932 Torresdale Ave., in Wissinoming. Midday Tuesday, the jackpot was boosted to $454 million. 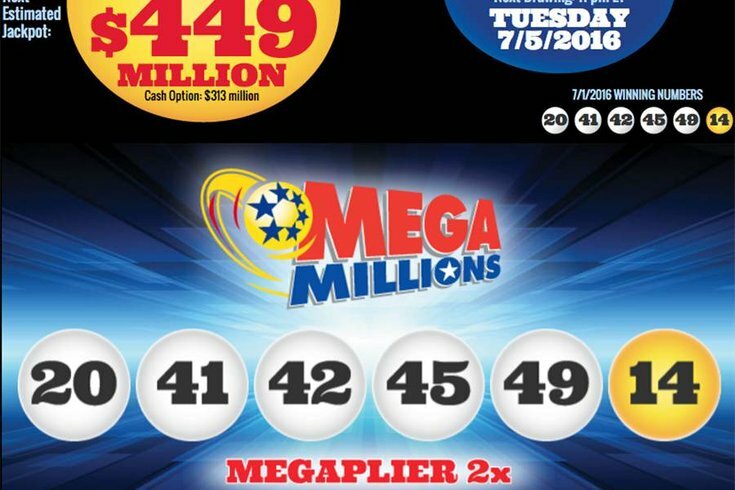 The ticket matched all five white balls drawn, 20-41-42-45-49, but not the yellow Mega Ball 14, to win a $1 million prize. It was sold with the $1 Megaplier option, which boosted the prize to $2 million instead of $1 million because Friday's multiplier was two. The retailer will earn a $10,000 bonus for selling the winning ticket. The prize must be claimed and the ticket validated before the winner is identified. Pennsylvania Lottery Mega Millions winners have one year from the drawing date to claim prizes.